RADIKITE TARIFA IS AN OFFICIAL KITESURF SCHOOL SPECIALIZED TEACHING ALL ITS MODALITIES FROM INITIATION TO ADVANCED (FREESTYLE, FREERIDE, SURFKITE OR HYDROFOIL) COUNTING WITH MORE THAN 10 YEARS OF EXPERIENCE GIVING CLASSES TO VISITORS FROM ALL OVER THE WORLD AND ALL AGES IN A FUNNY AND FLUID WAY PRIORITIZING SAFETY ALL THE TIME. 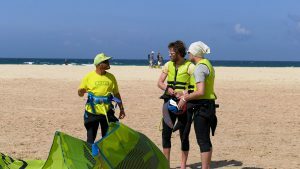 WE ARE THE ONLY KITESURFING SCHOOL IN TARIFA WITH FLOOR BEACH FACILITIES IN AN EXCLUSIVE AREA FOR BEGINNERS WITH ALL THE SERVICES (PARKING,BEACH BARS,LOCKER ROOM, COMPRESSOR, ETC) WHERE YOU CAN RENT KITE EQUIPMENT, HIRING THE RESCUE SERVICE (INCLUDED IN THE COURSES) OR INFORM YOU AND RESOLVE ALL YOUR QUESTIONS. YOU WILL ONLY PAY FOR THE LESSON HOURS THAT YOU CAN GIVE. IF THE METEOROLOGICAL CONDITIONS ARE NOT SUITABLE, WE WILL RETURN YOU THE MONEY. 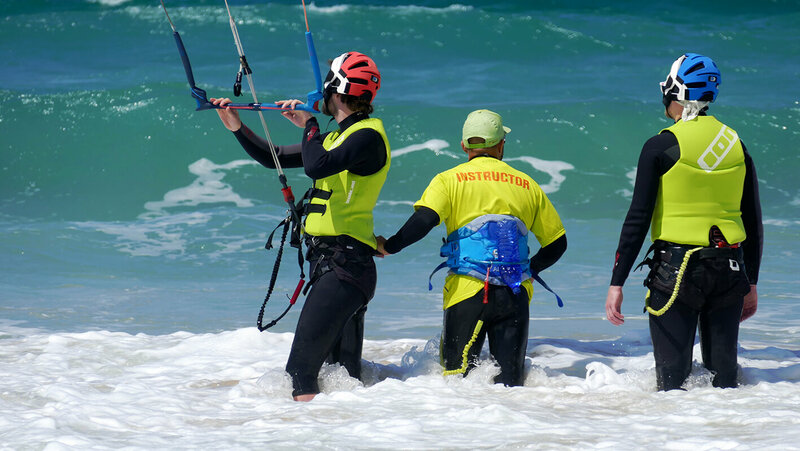 WE ARE VERY PROUD TO HAVE THE BEST TEAM OF INSTRUCTORS WITH INTERNATIONAL (IKO) AND NATIONAL (SPANISH SAILING FEDERATION) LICENSES, PASSIONATE FOR THEIR WORK THAT EFFORTES EVERY DAY TO TRANSMIT TO ALL OUR CLIENTS ALL OF ITS KNOWLEDGE. WE HAVE A WIDE EQUIPMENT RANGE FROM DUOTONE KITEBOARDING BRAND, LEADER IN THE SECTOR, WHICH WE RENEW EVERY YEAR TO FACILITATE YOUR PROGRESS AND REDUCE THE LEARNING TIME OR IF YOU ALREADY HAVE AN ADVANCED LEVEL AND WANT TO RENT, YOU WILL BE ABLE TO CHOOSE THE KITE MODEL OR BOARD TO ADAPTS TO YOUR STYLE. 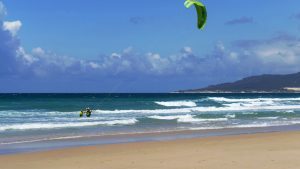 TARIFA IS KNOWN IN THE WHOLE WORLD AS THE CAPITAL OF THE KITESURF DUE TO ITS WINDS OF LEVANTE AND OF PONIENTE OFFERING SUITABLE CONDITIONS FOR THE PRACTICE OF WATER SPORTS GIVING US MORE THAN 300 WINDY DAYS DURING ALL THE YEAR. 1. SERIOUSNESS, PROFESSIONALISM AND COMMITMENT. Our clients opinion endorse us. Your school at the beach! We are the only one school installed at the beach. We are at Los Lances beach, between the school and free practice area. Only 3 km from the town inside a natural park in a unique wild environment. 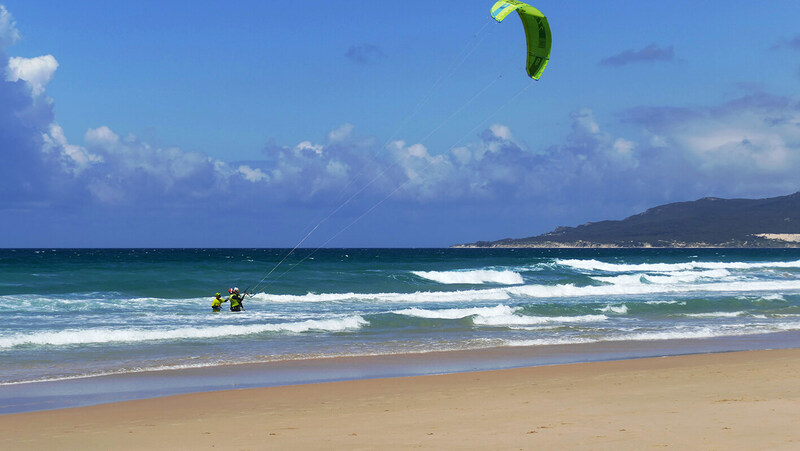 Beach area delimited of more than 2 km long and 300 meters wide exclusive for kiting. Our spot is the closest to the city center where sports practice is allowed between June and October. All amenities: free parking, beach bars, toilets, showers, changing rooms, rescue service "Sea Angels", etc. 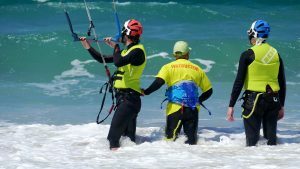 What requirements must the instructors comply? – Certified by the Andalusian Sailing Federation, the only legal degree to teach in Spain. 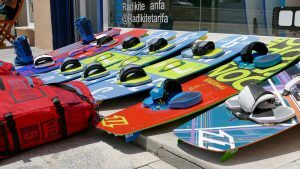 – International IKO (International Kiteboarding Organization). – Must be registered with Social Security. All this is important for an insurance to cover in the event of an accident. At Radikite we meet all these requirement. What formal requirements must the school adhere to? 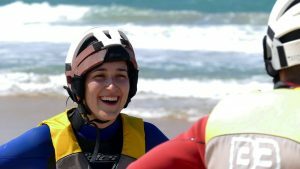 The school you choose must be certified by the Tarifa town hall, by the Andalusian Sailing Federation and the Junta de Andalucía – (Our register number is AT/CA/00253). They must also have an accident and liability insurance. VERY IMPORTANT. 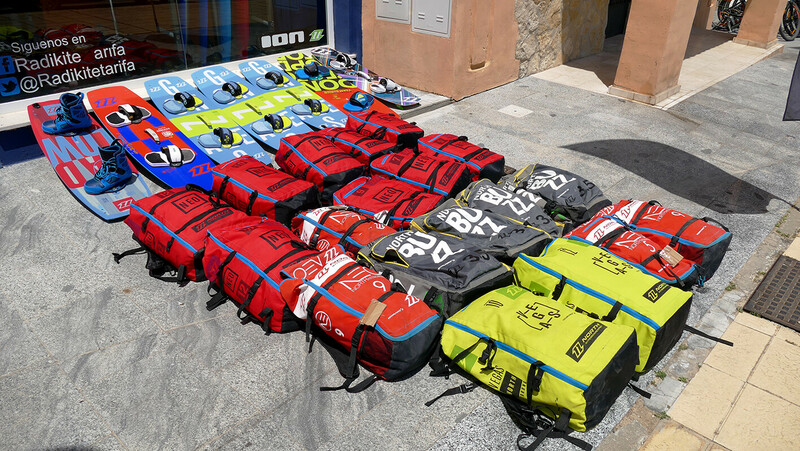 We have the best equipment from DUOTONE KITEBOARDING, undisputable leading brand on the market and we renew it every year to have the latest in innovation and safety. We also adapt it to you so that your learning process is as fast as possible. 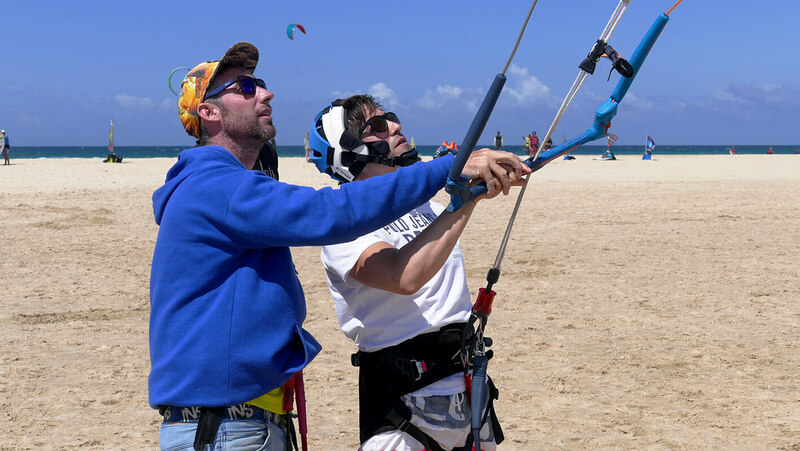 We don’t use foils or acrobatic kites during any stage of the course, from the very beginning you will be learning with inflatable kitesurfing kites, the same ones any experienced kitesurfer would use. 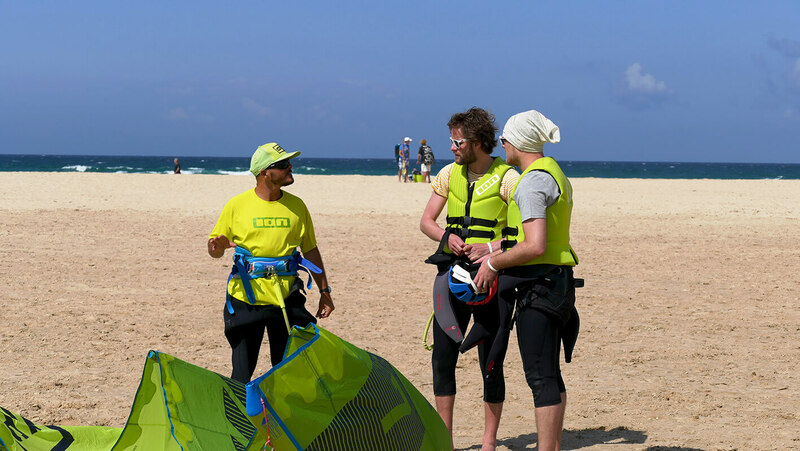 What factors should I be taking into account when choosing a kitesurfing school? The most important thing is a positive attitude and the instructor’s qualification, at the end of the day it’s “the people” who are the key of a good service. You can find out how professional we truly are on Tripadvisor . What’s the difference between a group and a private course? 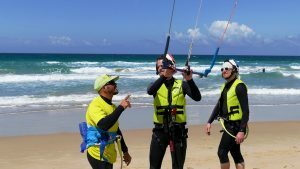 Group courses are a great way to discover and get a first taste of kitesurfing at an affordable price. But if what you want is to learn as fast as possible, we recommend private courses in which the progress is greater. A good option is to first take a full group course and then to do some private or semiprivate tutoring lessons to perfect your skill. What if I can’t take my course due to weather conditions? 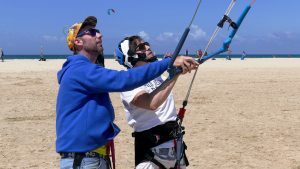 In Tarifa we have more than 300 windy days a year, so it’s rare for this happen. Even so, we will only charge the hours that you are being taught. If any hours are cancelled because of any weather conditions, we will give you your money back for those corresponding hours. As any sport it does have its risks, however, caution minimizes them. It’s normal that you may have some fears, but in almost every case they vanish as soon as you feel that you have complete control of everything that’s happening at all time. 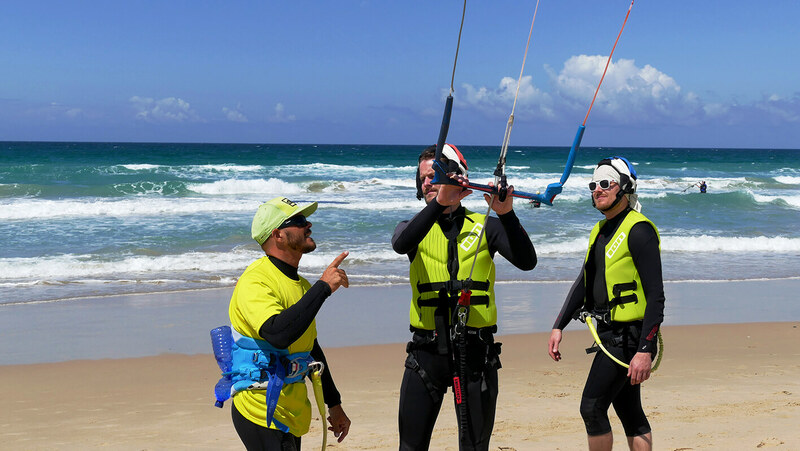 In addition, our instructors are trained to teach you how to keep control of your kite and to know what the boundaries are, giving you a sense of security. Nobody can promise you that in 3 days you will end up jumping around like a pro. But our three-day course is designed to give you in those 9 hours a firm grounding with which you can then practice and continue learning on your own. Every student is different and at Radikite we know it, so we adapt the teaching methodology to each individual according to their needs, skills and physical condition.